Do my children and baby need a visa? A visa is required for children and babies having their own passport. If your child/baby does not have their own passport, you do not need to apply for a visa. Can I fly to Vietnam without visa and buy one at the airport in Vietnam? No. You will need to apply for a visa before you go to Vietnam. The airline will ask you to show your visa or visa approval letter during check in. If you do not have it boarding will be refused! 1. Before departure to Vietnam you apply for your visa on our website. 2. We will request your visa at the Vietnamese immigration office in Vietnam. 3. After your visa has been approved we will send you the visa approval letter. 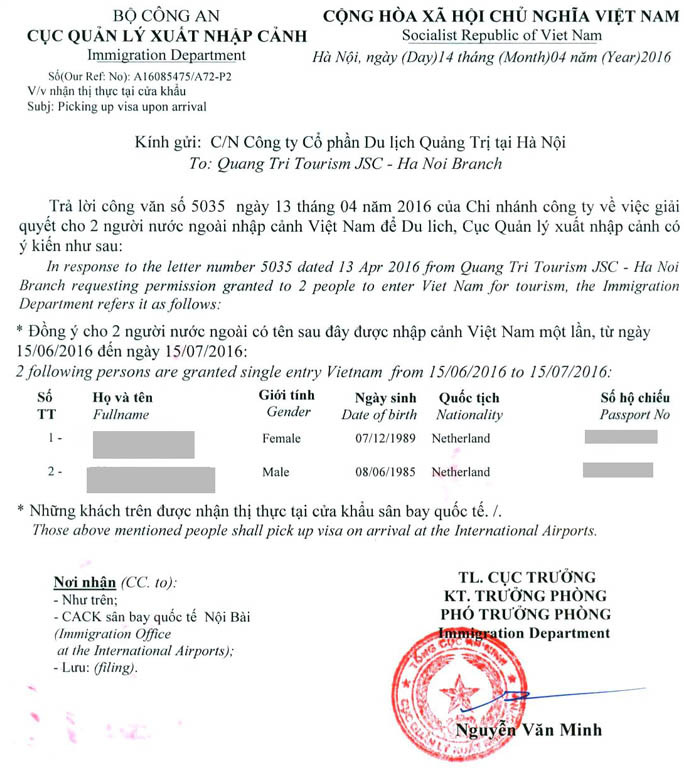 This letter is confirmation that you have been granted access to Vietnam and that your visa is ready for collection at the airport in Vietnam. 4. You print out the visa approval letter and bring it with you to Vietnam. On arrival at the airport go to the immigration office, show the visa approval letter and collect your visa. What is the advantage of visa on arrival compared to a visa from the consulate/embassy? You do not need to visit the Vietnamese consulate, thus saving you travel costs and time. You do not need to send us any documents and can keep your passport in a safe place. Emergency/RUSH visa available within 1 working day or less. In most countries the costs of a visa on arrival is lower than a visa at the Vietnamese consulate. You can apply from everywhere in the world. You can contact us day and night (24/7) for any questions or assistance you require. We can think of only one: You need to collect your visa at the airport in Vietnam. There will be a waiting time of 5...45 minutes, depending on how busy it is. Do I qualify for a visa on arrival for Vietnam? 2. Your passport is valid for at least 6 months at the date of arrival in Vietnam, and has 1 empty page for the visa sticker. 3. If you have a transit in Vietnam you will collect your visa during this transit. The transit time must be at least 2 hours. Collecting your visa may take between 10 and 40 minutes. 4. Visa on arrival for Vietnam is NOT available for some nationalities. Check this list. If your country is mentioned then you must apply in person at a Vietnamese consulate. Which visa types are available? With a single entry visa you can enter Vietnam only one time. When you leave Vietnam your visa will be invalid and you can not return, unless you apply for a new visa. With a multiple entries visa you can enter Vietnam as many times as you like, during the period that your visa is valid. How many days is a 1 month visa valid? How many days is a 3 months visa valid? I arrive by bus, boat, or train in Vietnam. Can I get a visa on arrival? No. If you arrive by bus, boat or train in Vietnam you need to arrange your visa in advance at a Vietnamese consulate. If you arrive by cruise ship then please contact your cruise organizer or travel agent. They usually arrange a visa for you. I am traveling/living abroad. Can I get a visa on arrival? Yes. You can apply from anywhere in the world. We will send you all documents by email. You print these out and bring to Vietnam. You may also fly from any airport in the world to Vietnam. All airlines are familiar with visa on arrival for Vietnam. I arrive by plane in Vietnam and leave by bus to Cambodia/Laos. Is this allowed? Yes, your visa will be valid for any border crossing and for all types of travel (bus, boat, airplane). My airport of arrival in Vietnam is different from my airport of departure. Is this allowed? Yes it is. With your visa you may exit Vietnam from all airports. Fill in your travel, passsport and contact details. Make sure to carefully check your passport details to prevent any problems with collecting your visa. You can easily and securely pay our service fee online with debit/credit card, PayPal or bank transfer. The service fee covers our time and costs to apply for your visa approval letter. After payment you will receive your order and payment confirmation by email. ⇒ If you do not receive our payment confirmation email within 24 hours please check your spam/junk email box. Add info@visa-for-vietnam.com to your address book to prevent our email from arriving in your spam/junk email box. We will apply for your visa at the Vietnamese immigration office in Hanoi. When your visa is approved (this will take 3 working days or less) we will send you a digital copy of the visa approval letter by email. 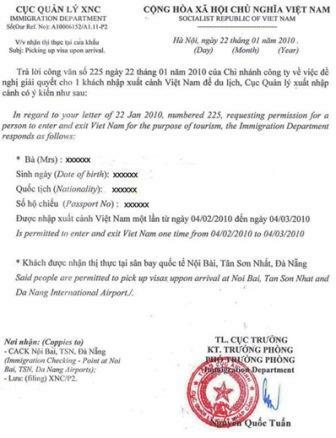 With a print out of this document you are allowed to fly to Vietnam. ⇒ Make sure that all passport details in the visa approval letter are correct. Airlines may refuse to let you board the airplane if there are (small) errors in the approval letter! We will also send you form N1 (2 pages). Print it out, fill in and sign. One photograph needs to be attached as well. 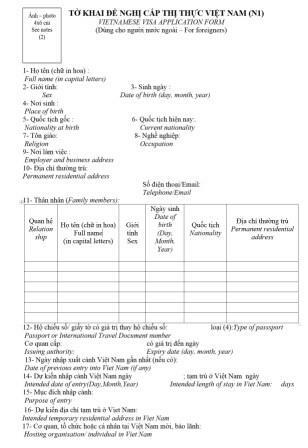 This form you will also need to bring to Vietnam. • Format of the photograph: 3x4, 3.5x4.5 (passport size) or 4x6 cm. • White background. Both color and black/white are allowed. • Face straight into the camera. • No sunglasses or head covered. 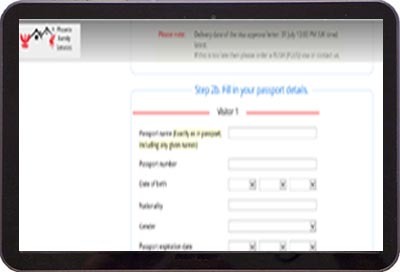 ⇒ For help with filling in the form we have a 3 page instruction manual that we will send you when you order a visa. You are now ready to fly to Vietnam. Show the print out of the visa approval letter to the airline staff when you check in. You will then be allowed to board the airplane. Upon arrival in Vietnam find the immigration office, indicated as "landing visa", and hand over the visa approval letter, form N1 and your passport. After 5... 45 minutes, depending on how busy it is, your name will be called and you will receive back your passport with the visa. You will then pay the stamp fee: 25 US$ for a single entry visa and 50 US$ for a multiple entries visa. ⇒ The landing visa desk is open day and night, all days of the week, including all holidays. ⇒ Payment of the stamp fee must be done CASH, in US$ or Vietnamese Dong. Cards will not be accepted. So please bring enough cash with you to Vietnam. How do I apply for a visa on arrival? You apply online on our website for your visa. You do not need to send us your passport or any other documents. We will forward your visa request to the Vietnamese immigration office and they will issue the visa approval letter. We will send you a digital copy of this letter by email. With the print-out of the approval letter you will be allowed to fly to Vietnam and collect your visa at the airport. Check the step by step procedure for all details. What is the delivery time of the visa approval letter? Visa are only issued during opening hours of the Vietnamese immigration office: Monday till Friday, from 8am till 11:30am and from 1:30pm till 5pm (Vietnam time). Saturday and Sunday from 1pm till 5pm. If you order outside office hours then your visa application will start at the first following working day/hour. How long before arrival in Vietnam can I apply for my visa? You can apply up to 6 months before arrival in Vietnam. I do not know yet which airport I will arrive. Can I already apply for a visa? I do not know my exact arrival date. Can I already apply for a visa? You will need to select a start date when you apply for your visa. If you are not sure then please select the first possible date you may arrive. You are allowed to arrive later than the visa start date. But please note that the visa expiry date is fixed and will not change if you arrive later. You can also select a 3 months visa instead of a 1 month visa. Example: your arrival date will be between 3 and 13 July. You like to stay for 4 weeks in Vietnam. Then select as start date: 3 July and choose a 3 months visa. Can I arrive in Vietnam earlier than my visa start date? NO. This is not allowed. The airline will not let you check-in if you arrive earlier than your visa start date. Can I arrive in Vietnam later than my visa start date? Yes, you may arrive on any date during the period that your visa is valid. Please note that your visa expiry date will not change if you arrive later! Example: you applied for a 1 month visa with start date 5 April. You arrive on 15 April. You will then receive a visa valid from 5 April till 5 May. So you have 21 days left to visit Vietnam. Can I get a private visa approval letter with only my name on it? Yes you can. Please select the option "private approval letter" when you order your visa on our website. Please note that private approval letters are not available for 4 hour and 2 hour delivery service. I have made a mistake in my visa application. Can you change the visa approval letter? It is important that all data in the visa approval letter is correct and as shown in your passport. You need to show this letter to the airline when you check in. The airline may refuse you to board the plane if there are (small) mistakes in the letter! We can not change the approval letter ourselves. We are obliged to apply for a new visa approval letter at the Vietnamese immigration office. Please carefully check that all details are correct when you apply for your visa. And do check the confirmation email we will send you after you have placed your order. In this email you will find all your visit, passport and contact details. What do I need to bring to Vietnam to collect my visa? Print-out of your visa approval letter. If it consists of multiple pages then print out all pages and bring to Vietnam. Filled in form N1 (2 pages) with one photograph glued or stapled. Photo size is flexible and can be anywhere between 3x4 cm and 4x6 cm. Both B/W and colour are allowed. One form per person is sufficient. CASH US$ or Vietnamese dong to pay for the stamp fee at the immigration office at the airport in Vietnam. Passport valid for at least 6 months after your date of arrival in Vietnam, with at least 1 empty page. Do I need to have an official photograph? No, the requirements are not very strict. A recent picture of yourself showing your face straight into the camera is OK. You can use a passport photo or a digital print out on decent paper. Photo size is flexible and can be anywhere between 3x4 cm and 4x6 cm. Both B/W and colour are allowed. How will I collect my visa in Vietnam? Upon arrival at the airport in Vietnam find the immigration office, indicated as "landing visa" or "visa upon arrival". Hand over the visa approval letter, form N1 and your passport. Then take a seat and wait for the processing of your visa. After 5... 45 minutes, depending on how busy it is, they will call your name and you will receive back your passport with the visa. You will then pay the stamp fee: 25 US$ for a single entry visa and 50 US$ for a multiple entries visa. Where is the visa desk in Vietnam? The visa desk is located inside the airport, just before customs. It is indicated as "landing visa" or "visa upon arrival". What are the opening hours of the visa desk in Vietnam? The visa desk is always open, 24 hours per day, every day in the year, including all holidays. I have a transit in Vietnam. Where do I collect my visa? You will collect your visa at the airport of transit. Please make sure that the transit time is at least 2 hours, so you have sufficient time to collect your visa. It might take 10...45 minutes to collect your visa depending on how busy it is. How long is the waiting time to collect my visa in Vietnam? The waiting time is between 5 and 50 minutes, depending on how busy it is. 1) Our service fee. This is the fee you pay us to apply for your visa. You pay this amount on our website. 2) The stamp fee. This is the fee you pay when you collect your visa on arrival at the airport in Vietnam. The stamp fee you have to pay CASH in US$ or Vietnamese Dong. Cards are not accepted. 1. Service fee. This is the fee you pay us for arranging your visa. You pay by card, Paypal or bank transfer. 2. Stamp fee. This is the fee you pay in Vietnam at the airport when you pick up your visa. CASH payment only in US$ or Vietnamese Dong. For a 1 month single entry tourist visa, standard delivery time, the total price is US$ 46 (our service fee is US$ 21 and the stamp fee is US$ 25). Check our prices for all prices and volume discounts. Which payment methods do you accept for payment of the service fee? 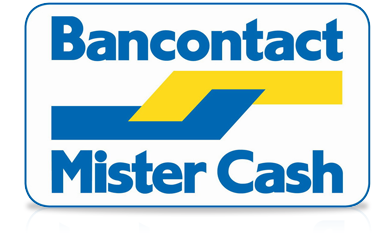 We accept credit and debit card, Paypal, iDeal, Bancontact and bank transfer. My card payment was not successful. What should I do? Occasionally you might experience problems when trying to pay with debit or credit card. In that case please contact us by email or phone, and we will assist you in getting your payment through: We can send you a separate payment link by email, or we can take your payment by phone. In any case we have your order details on file so you will not loose any data. After payment on the website (step 3) I am not being redirected to step 4 (payment confirmation). Was my payment successful? Occasionally this happens, but in most cases the payment has been successful. If in doubt then please contact us by email or phone and we will check. The visa approval letter is the confirmation that your visa has been approved and is ready for collection in Vietnam. We will send you an electronic copy of the visa approval letter by email. You need to print it out before departure to Vietnam and show to the airline when you check in. Boarding is only allowed if you can show a print-out of this letter. The letter will show your visa type, visa period and your passport details (name, gender, date of birth, nationality and passport number). It is standard procedure that the Vietnamese immigration office combines several names in one letter for reasons of efficiency. If you do not want to share your details with others then please select the private approval letter option. Do I need to print out the visa approval letter or can I show the letter on my phone/tablet/PC? When you check in with the airline you need to show the visa approval letter. Sometimes the airline will accept to see the letter on your phone/tablet/PC, and will let you board the airplane. But please do not count on this! Always make sure that you have a print out of the visa approval letter! I forget to print out and bring the visa approval letter. Can I travel to Vietnam? No, the airline will not allow you to board the airplane if you can't show the visa approval letter. Sometimes they will accept to see the letter on your phone/tablet/PC but please do not count on this. If this happens please give us a call and we will immediately resend the letter to your or the airlines email address. We can not change the approval letter ourselves. We are obliged to apply for a new visa approval letter at the Vietnamese immigration office. Corrections will take about 3 working days processing time. All changes/mistakes, with the exception of visa start date and visa type, we will do free of charge. For changes in visa start date or visa type you pay the standard service fee. For RUSH corrections (1 working day) we charge 20 US$. We always send the visa approval letter within time. Delivery dates and times are shown when you order your visa. If you do not receive the letter please check your spam/junk email box first, and make sure you inbox is not full. Contact us if you have not received it and we will resend immediately.